The new iMac Pro almost certainly helped give Apple a larger share of the PC market in Q1. Apple was a bright spot in the global PC market last quarter. Market analysis firm Gartner says Mac shipments grew 1.5 percent, even as the total market for laptops and desktops dropped 1.4 percent. The U.S. helped drag down the global totals, with a 2.9 percent decline. Still, that helped push up Apple’s share of the American market to 12.6%. 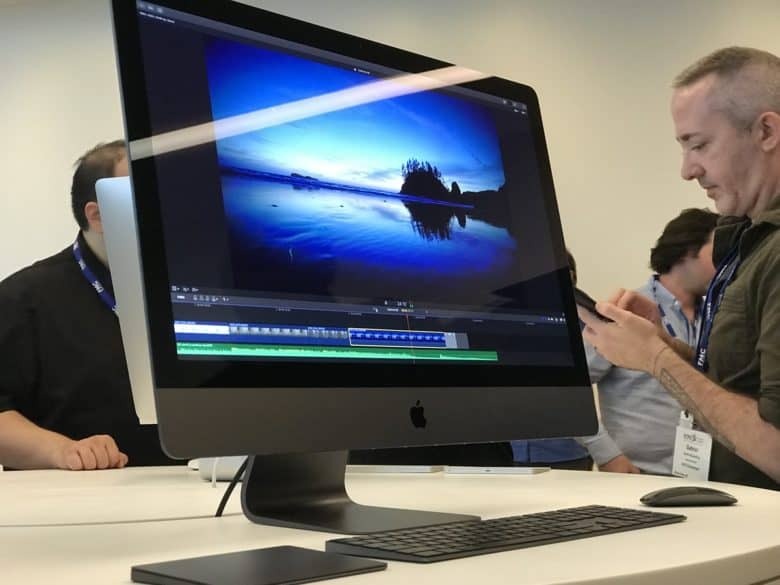 Some of the Apple’s improvement in the first three months of this year is likely due to the December launch of the powerful iMac Pro desktop. Other potential customers are likely waiting for the upcoming MacBook Air that’s rumored to cost less than its predecessor. This could be the beginning of a banner year: respected KGI Securities analyst Ming-Chi Kuo predicts that Apple’s laptop shipments will grow 13 percent to 16 percent in 2018. It’s off to a good start. The company’s global shipments hit 4.26 million in the January-to-March period. It shipped 1.49 million Macs just in the U.S. These figures are based on estimates by Gartner. Apple itself won’t announce how many devices it sold in Q1 until May 1. HP’s shipments rose 2.8 percent last quarter, enabling it to hold onto its top spot in the world PC market. Its share of the U.S. market declined, though. Lenovo was in second place, with shipments staying flat. Dell did quite well in Q1, with its shipments rising 6.5% globally and 7.6 percent in the U.S. It’s actually the top PC maker in the U.S.
Apple held the fourth spot in this race, both globally and in America. Asus and Acer each had poor first quarters, with their shipments dropping 12.5 percent and 8.6 percent, respectively. 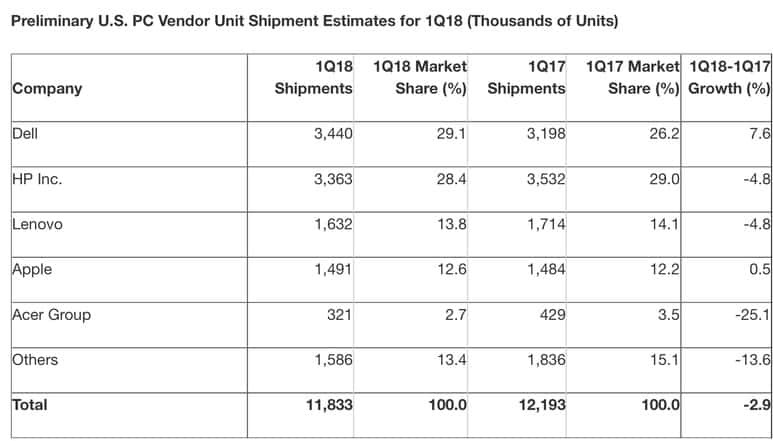 Gartner’s estimated figures for the Q1 2018 PC market show Apple’s share is improving in the U.S.
Prices for desktops and notebooks increased last quarter, partially driven by shortages in critical components, including DRAM. Weaker demand is also responsible. “With fewer people buying new machines, manufacturers need to get the highest profit margin from each sale. To do that, they are raising the selling points and focusing on customer experience or perception of value,” wrote Mikado Kitagawa, principal analyst at Gartner.